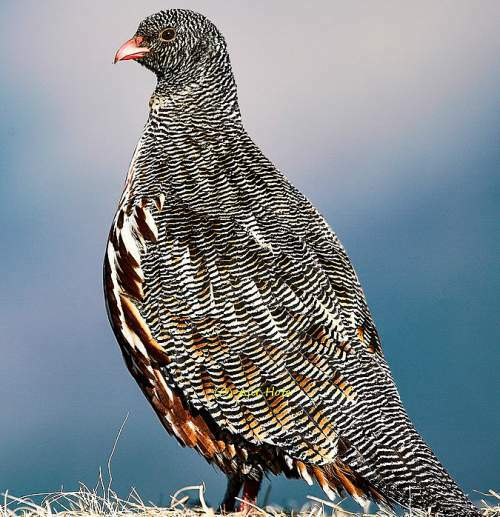 Home › National Bird of India › Nicobar-scrubfowl › Snow partridge - Lerwa lerwa. The snow partridge (Lerwa lerwa) belongs to the family of pheasants, Phasianidae. There are two recognized subspecies of snow partridge. The subspecies L. l. lerwa occurs in Himalayas in Pakistan and northern India and Tibetan Plateau. The subspecies L. l. major occurs in Central China. The IUCN (International Union for Conservation of Nature) has categorized and evaluated these birds and has listed them of "least concern". These partridges are small birds, measuring 30 to 40 cm in length and weighing 450 to 700 grams. The underside is reddish and the bill and the feet are bright red. These birds inhabit alpine slopes at about 3,000 meters. They prefer open rocky hillsides. They descend to 2,000 to 2,700 meters in the winter. These partridge are monogamous birds and the breeding season lasts between May and July. The snow partridge are highly territorial. They feed on seeds, insects, flowers, roots, shoots and leaves. 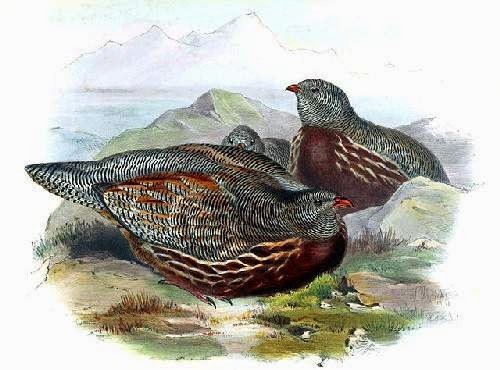 Current topic in Birds of India: Snow partridge - Lerwa lerwa.